1. Give your audience a behind-the-scenes look your life and business. Social media is all about building relationship and connection with your audience and community. 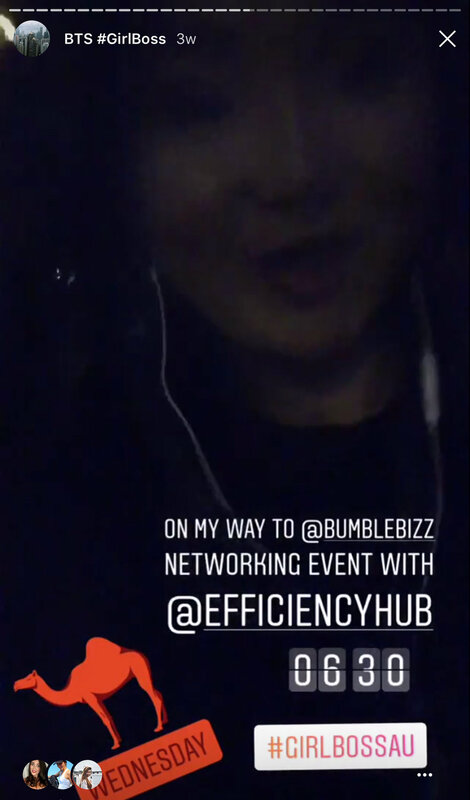 Giving your followers a behind-the-scenes look your life and business is one of the best ways to do so as this gives people the opportunity to get to know you better. 2. Share a sneak peeks of what you’re working on. Whether it’s an upcoming video, blog post or a project, it helps build anticipation by giving your followers a peek into what you’re working on. Get them excited by sharing a teaser for your upcoming video/ blog post or a snippet of the content of your upcoming launch! 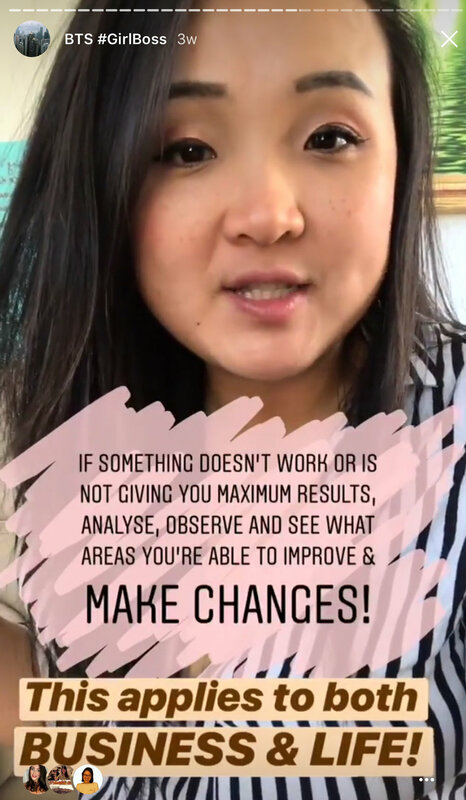 You can offer more value to your followers by having themed days on your Instagram Stories such as Motivational Monday, Wellness Wednesday and Freebie Friday! It helps keep you on track, curating consistent content and it gives your viewers something to come back to every week! You will never run of content ideas for Instragam Stories anymore! Creating content alone is simply not enough, be sure to have a call to action and direct your audience somewhere. What about that new photo that you’ve just uploaded? Tell your followers about it - write some text, blur out the actual photo on your feed and entice your audience to check out the photo. 5. Treat it as a VLOG with day in the life of…. This is an extension of BTS where you treat your Instagram Stories like your personal vlog by sharing your “day-in-the-life”. By allowing them into your personal life - it is a great way to engage and connect with your audience to the next level. Whether it is a brand you love, someone that you admire, a collaboration with like-minded accounts or simply an image or video that you simply adore and resonate with - sharing someone else’s content and tagging them in your story is one of the best ways to gain more engagement and views. The easiest way to do this is by taking a screenshot(s) of the Instagram account or content you’re loving and tagging them in your Story! Think of this as a mini blog-post series where your viewers have something to take away at the end of it. Share a tip that will benefit your audience. Teach them how to do something. Run through the step-by-step process that they can implement themselves. If you’re a wellbeing or food blogger, share the recipe for your favourite dish. If you’re a business coach, show your audience how to be more productive and get more done in a day. If you’re a photographer, share some of your editing tips. Try to keep things short and sweet as many of the viewers have an attention span of a goldfish. Get creative with Instagram stories - decorate your posts with stickers, include pop-ups and colour contrasts, have a good mixture of videos, images and boomerangs. Everyone loves a discount. Remember, the themed days we spoke about earlier? Try offering an exclusive discount on a product or service on Freebie Fridays - which will help boost your sales! You get the extra sales, your audience feels appreciated - it’s a win-win situation here! You can do this via the poll function or getting them to direct message (DM) you any burning questions that your audience have! You’re essentially killing two birds with one stone.It doesn’t require much effort on your part to “create the content” as the topics are provided by your audience. And, the great thing about a Q&A is, you’re always providing value or solution to your followers. If we can’t promote our new work or launches to our own community, where else can we do so, right? I mean after all the sneak peeks, BTS, discount codes, this is what we’re here for, right? Whether it is a new video, new lead magnet, new product launches - whatever it is - use your Instagram Stories to promote it! Again, get creative with this. You can create a 15s teaser video or boomerang of the actual content - anything to get your viewers excited. The most important of all is - stay authentic and just have fun! the ultimate Instagram Stories Content Guide!